This recipe is actually perfect for coming out of last week, as, like so many things that happened last week it arose out of the ashes of me screwing something up because I did not know what I was doing and was not paying attention. Last week was just that kind of week. I need a nap. Or a vacation. A few years ago, I’d bought mung beans, dried, because I understood that they could be cooked relatively quickly, like lentils. So I put them in a pot with water, on a burner, and then wandered off to do something else. By the time I came back, I had mush instead of beans. Oops. So I made a bean loaf. You know, like meatloaf, but without vegetarian. The thing is, “bean loaf” sounds kind of gross, and baking this in a loaf meant you only had a few edges. Plus, it wasn’t really that successful at holding its shape when sliced. You really should soak the beans overnight, so far as I can tell, but you can also just dump a kettle of boiling water over them and soak them for about an hour. They will plump up quite nicely. They are “done” cooking when they are starting to fall apart but haven’t actually fallen apart yet. Since then, I’ve refined this so that I have less bean mush and more mushy beans, and revised the add-in vegetables and seasonings somewhat to create a flavorful bean-based patty. Actually, if you make them my way, they’re more ball-shaped, but bean balls isn’t appetizing either. We’ll go with patties. This recipe makes 16 patties measured out by a 1/2 cup ice cream scoop. These store and reheat well, but I have not tried freezing them. Structural integrity is still low, but they taste good, and who cares if your patty falls apart a bit? You already have a fork on hand. 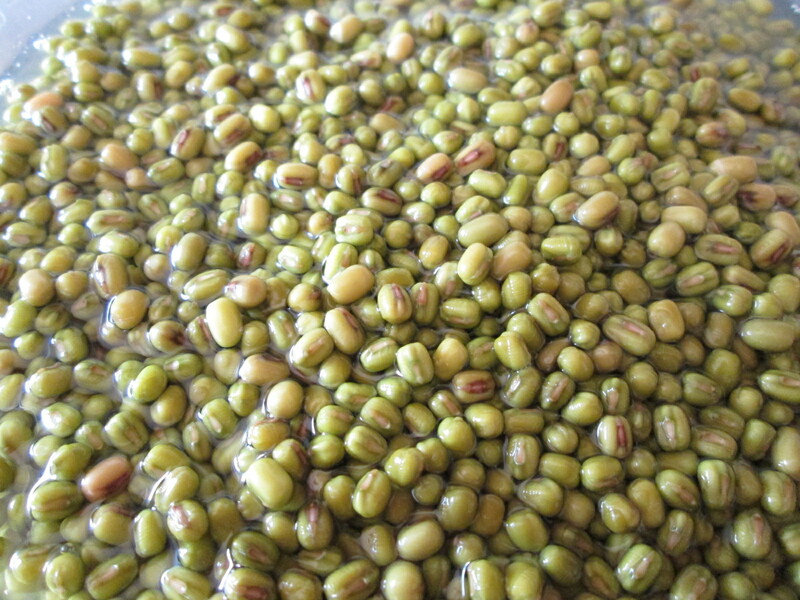 Put soaked mung beans in a saucepan and cover with water so that there’s about an inch of water over the mung beans. Put over high heat, covered, and bring to a boil. Boil 8-10 minutes, turn to low, and simmer, covered, for 25 minutes. Water should be completely absorbed, and beans should be slightly mushy but not entirely without structural integrity at this point. Remove from heat, remove cover, and let cool while you prep the veg. Using a food processor, grind up all the veg. You can do this any way you like, but here’s what works for me — I use the shredder attachment for the carrots and bell pepper, and then put the S-blade in to grind them up a bit more. The scallions and parsley will need liquid, so add the oil or vinegar to this. The mushroom should be fine with just the S-blade. 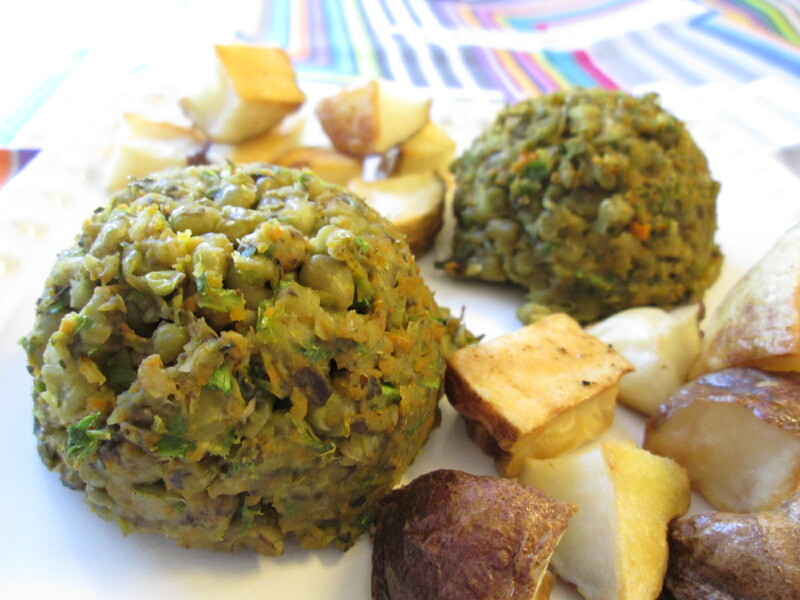 Add the ground vegetables and all the seasonings, along with the mung beans, to a large bowl. Stir well, longer than you think you should, and then use your hands to really work the beans. There are two ways to form patties — either grease a muffin tin and fill it, or make scoops with an ice cream scoop and place on a cookie sheet lined with parchment paper or greased lightly. 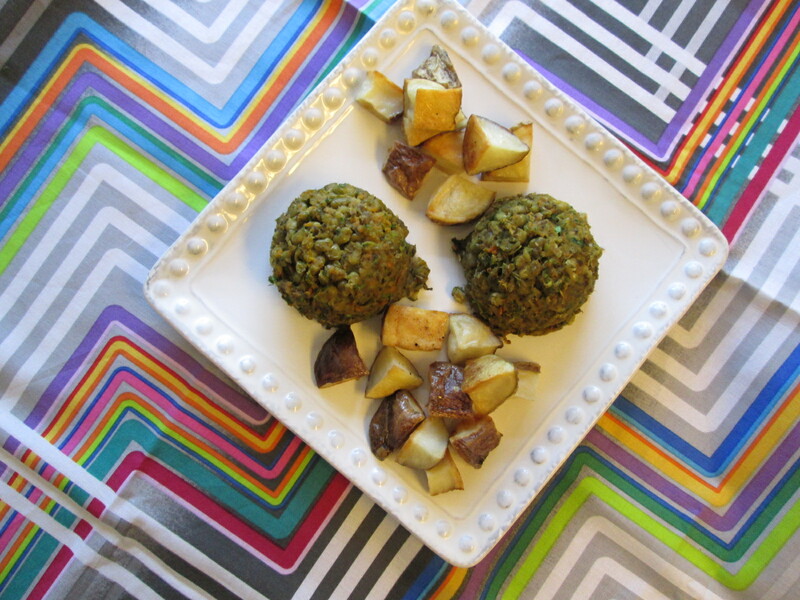 Make sure to pack the bean patties/balls together as you form them — these won’t be masterpieces that will stay together through a coming apocalypse, but they will hold their form as you dump them out of the muffin tins. Bake 15 minutes, then enjoy.